A ‘SICKNESS’ on a Jet2 flight from Spain has caused British passengers to ‘fall ill’ triggering an emergency response. 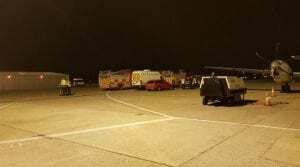 Ambulances, police and fire brigades were waiting to attend affected travellers when it arrived at Leeds Bradford Airport at 9.45pm on Saturday. The plane had flown from Reus, near holiday hotspot Salou in Catalunya. Paramedics described how four passengers were ‘being violently sick to the point where one passed out’ and shut the plane doors to avoid the illness spreading. Police on the scene believe it to be ‘nothing more than a sickness bug’. A Jet2 spokesperson said: ‘We can confirm that the crew on board flight LS298 from Reus to Leeds Bradford Airport arranged an ambulance for two passengers who were taken ill.
‘The crew were alerted to a further two, non-associated cases of passengers feeling unwell on board. ‘On arrival, as a precaution they were immediately checked over in the ambulance before heading home. 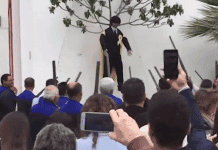 DO YOU HAVE NEWS FOR US at Spain’s most popular English newspaper - the Olive Press? Contact us now via email: [email protected]es or call 951 273 575. To contact the newsdesk out of regular office hours please call +34 665 798 618. Could that be an aerotoxic syndrome? Saludled, for your info aerotoxic syndrome as of 2013 this syndrome is not recognized in medicine. For all those who don’t know what it is checkout Wikipedia. Sure saludled was just being Flippant!